Tokyo, Japan - November 11, 2015 - NEC Corporation (NEC; TSE: 6701) today announced plans to intensify its efforts toward the research and development of Artificial Intelligence (AI) technology and the commercialization of solutions incorporating this technology. AI technology refers to the use of computers for intellectual activities conventionally carried out by human beings, such as learning, recognition and understanding, prediction and inference, and planning and optimization. Through its research and development of AI-related technologies since the 1980s, NEC possesses some of the world's leading technologies in a number of fields that include speech recognition, image and video recognition, language and semantic comprehension, machine learning, forecasting and prediction detection, and optimal planning and control. Going forward, NEC will continue to utilize these AI-related technologies to develop and deploy solutions aimed at achieving safer and more secure environments in a wide range of fields, including public safety, monitoring of large-scale social infrastructure systems, demand forecasting and efficient control of energy, and strengthening of corporate marketing and improvement of operational efficiency. In addition, NEC plans to increase the number of personnel involved in AI-related research and development, consulting, and other relevant activities to approximately 1,000 within the next 6 years. "With the information explosion and improvement of computer processing power in recent years, great strides have been made in the advancement of AI-related technologies. NEC plans to strengthen its existing technologies and accelerate the development of new ones in an effort to launch advanced solutions incorporating these technologies," said Katsumi Emura, Senior Vice President, NEC Corporation. "In addition to leveraging our advanced machine learning technologies to contribute to the resolution of issues facing society today, NEC will continue to promote technological innovation aimed at the realization of AI capable of complementing human thought and decision-making abilities." Face recognition technology: NEC's face recognition technology has taken first place three consecutive times in the Face Recognition Vendor Test performed by the U.S. National Institute of Standards and Technology (NIST). Learning based super-resolution technology: A technology used to sharpen hard-to-see images such as those captured at night, in bad weather, or from afar. Crowd behavior analysis technology: A technology used to detect abnormalities in congested environments from changes in crowd behavior. Object fingerprint technology: A technology used to identify individual industrial products and parts. Optical vibration sensing technology: A technology used to estimate the internal deterioration of structures based on video images of the surface taken by camera. Invariant analysis technology: A technology used to automatically discover subtle signs that cannot be perceived by human beings from correlations in data. Heterogeneous mixture learning technology: A technology used to automatically discover patterns hidden in big data. Textual entailment recognition technology: A technology used to determine whether or not two sentences have the same meaning. 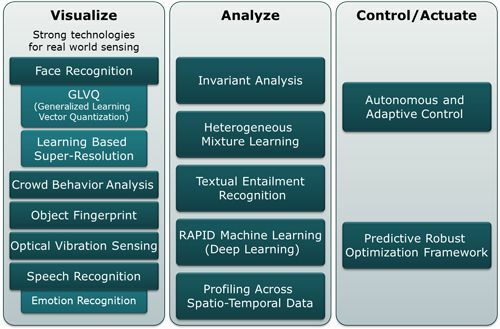 RAPID machine learning technology: A technology used to automatically learn trends in big data through deep learning. Profiling across spatio-temporal data: A technology used in combination with face recognition technology to swiftly detect targets matching specific appearance patterns from massive amounts of video footage. Autonomous and adaptive control technology: A technology capable of adapting to environmental changes that cannot be predicted in advance that is used for optimal placement and distribution of people or objects. Predictive robust optimization framework technology: A technology used to optimize decisions and plans based on analysis and prediction by NEC's propriety heterogeneous mixture learning technology.